The Prime Minister has announced a list of MPs whose heads shall grace the banisters of Westminster as her government adopts a new Tudor-esque style. Theresa May has ordered the beheading of numerous MPs, including Number 10 rival Michael Gove, and Larry the Cat. Larry has supposedly been foregoing his cat litter, instead favouring Mrs May’s teacups. Mrs May said she was excited for the new decoration of heads to be installed “as soon as the blocks come in”. The Prime Minister said the move was inspired by the imperial nostalgia brought about by Britain dominating almost all of the world at the Olympics this year. Mrs May explained: “My colleague Heather Wheeler [Conservative whip] was getting right excited about the whole empire thing, and I thought – why stop there? She also stated the new method of governance would assist with her attempts to bring the UK into a new age of digital. Speaking on her flagship policy of ending “modern slavery”, Mrs May assured a more Tudor-like form of slavery would be adopted as soon as possible. “For too long,” she said, “we have been doing slavery completely wrong. Instead of looking to the past for inspiration, we are looking to the future, and attempting to modernise slavery for the new age. 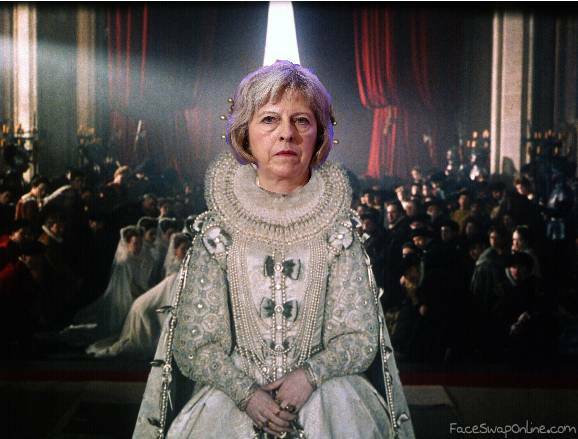 MPs have had to get used to the new dress code of the Commons, including (but not limited to) ruffs, doublets, and farthingales. Speaker of the House, John Bercow, commented on the new approach: “I have to say I am a fan of the ruffs, and do admit that – as a completely outdated institution in a crumbling building – we might as well go the whole hog. "Even on the most exalted throne in the world we are only sitting on our own bottom" - Montaigne.